Silverfast may be known to some of the folks that used image scanners where Lasersoft products were and still are a major players - a market which is obviously sharply shrinking. Consequently Silverfast released some products for digital cameras including Silverfast DCPro. 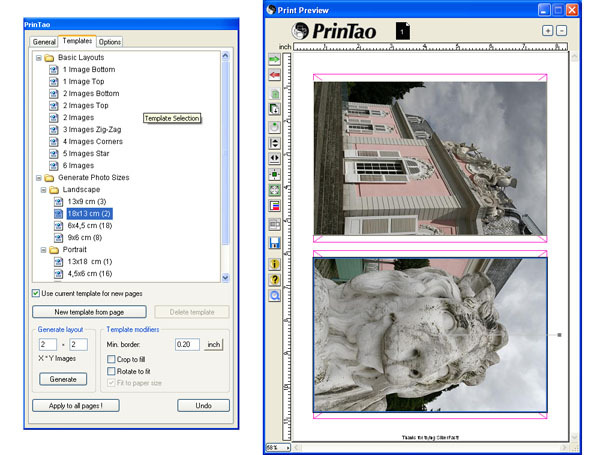 Its pricing is more up-market obviously targeting professional users with a strong background in color processing. A reduced-feature version is also available at a much cheaper price. 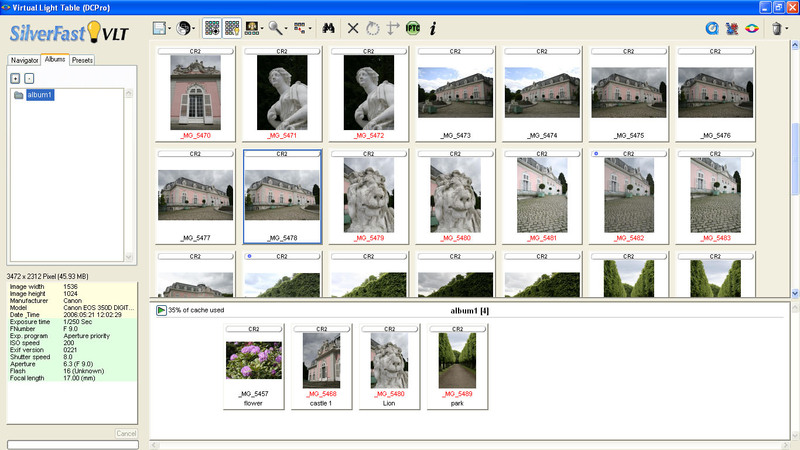 VLT can be used to browse image directories, organize images into albums, assign keywords to images, search for images and queue them for batch processing plus some other secondary tasks. Unfortunately VLT does not offer image ratings which is usually a feature present in most competing products. 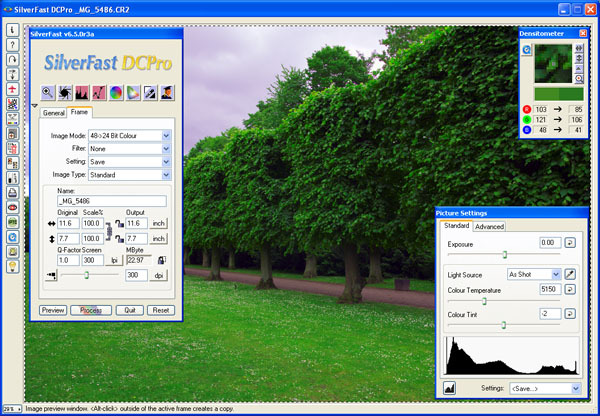 On the more simple side of life DCPro offers a pretty good color cast removal tool and you will also find a simple slider control for global saturation. The controls for exposure correction are easily usable by normal mortals and the image auto-correction seems to work better than in most other products. Various sharpening filters and noise reductions options are also available. On the downside there're no controls whatsoever for correcting lens-specific flaws such as vignetting, CAs or distortions - quite disappointing for a product in this price range. There're also a couple of other oddities - e.g. when magnifying to 100% it is only possible to move around via the "Navigator" and not via the standard window sliders and you have to generate a formal preview in order to observe the effect of the sharpening filters (as well as the GANE noise reduction). PrinTao is a dedicated processing module for printing. It is loosely integrated into VLT. It offers quite a bit in terms of print templates and you can add your own to the list. Silverfast DCPro is capable to produce very sharp outputs easily matching Adobe Camera RAW and beating most others by quite a margin. The resolution/noise balance is also quite harmonious. 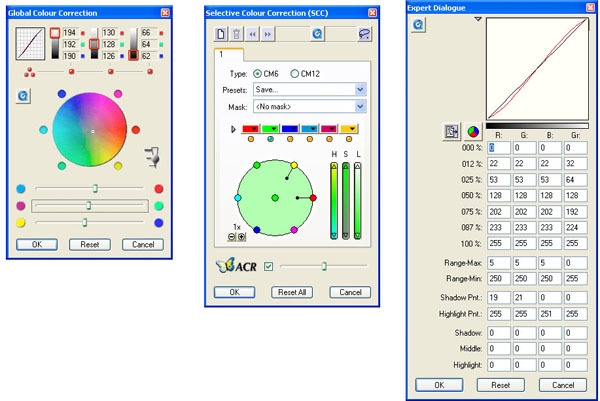 The application offers two noise reduction methods - GANE and a typical luminance/chroma noise reduction. The latter works pretty well. GANE has its origin in the scanner era so it is quite aggressive even in the suggested "Low GANE" mode (can be tuned down though). The primary strength of the product is the color tuning IF you know what you're doing - the application is far from simple here. However, Silverfast also offers a pretty decent auto-correction when used in conjunction with the color-cast removal filter. The manual exposure tuning is quite straight-forward though and roughly comparable to the rest of the gang. As mentioned above you will not find any lens flaw correction in this product so you have to rely on secondary products for this. Silverfast DCPro is a decent product but you can still feel that it was adapted from scanner software rather than developed from scratch specifically for digital cameras. The user interface feels a little unfinished and unstructured here and there and the lack of lens-flaw correction is a bit strange for a pricey product. However, the quality of the image conversion is very good with high resolution figures, comparatively low noise (when using a bit of color noise reduction) and usually good colors to start with. The exposure controls are straight forward and reasonably detailed whereas the level of color control options is breathtaking but also difficult to use unless you've a decent knowledge in color theory combined with a willingness to explore the application in this respect. If you're looking for a simple life better look elsewhere.